Funi hated all four-legged animals: hurling himself five feet into the air, trying get at a tiny dog that was snuggled in an inner coat pocket of a visitor. When he escaped outside, which was any time anyone left a door open, even a few inches, he attacked. He leapt on to the back of a much smaller cat and only gave up when the cat climbed a tree. When Funi could no longer hold on to its back he slid down the tree and circled it with the intensity of a hunter gone wild. Even with a screen door closed, when Funi saw a rabbit outside, he became a black blur, running with so much speed he tore through the screen, running after his prey oblivious to bushes, flowers, and fences. He was territorial. Visitors were scrutinized and, if found wanting by his enigmatic standards, would bite, not so gently, a toe or nip an ankle. However he reserved his greatest sense of ownership for the pillow on the right side of my bed. 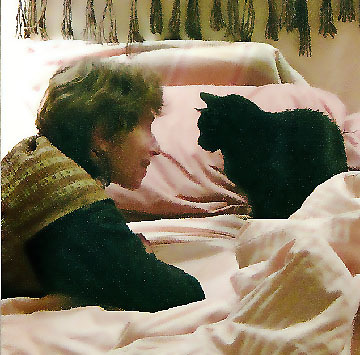 If anyone deemed it necessary to lie down on the bed, when Funi was ready to sleep, he would pace the two sides of the bed not next to the wall, meowing insistently. If the visitor ignored this warning, Funi would leap up onto the person’s body and slowly make his way up the body, incrementally increasing the volume of cat sounds. If the visitor continued to ignore Funi, he would creep up to the person’s neck, pause, and make sounds that seemed to be saying, “Get up. Get off my pillow. Now!” If this still didn’t rouse the prone person, my cat would collapse onto the person’s head, and yowl at the top of his lungs, making it difficult for anyone in this position to breathe. Inevitably, no matter the size of the person, the cat won. The person got up out of the bed. Whereupon, Funi curled up into a ball and slept on “his” pillow. Although I wished I had a relationship with a two-legged, when I felt depressed Funi would jump up and snuggle lovingly around my neck. When I was joyful we danced. He traveled with me to New Mexico, perched on his carry case, watching his old world disappear, looking intently as new vistas appeared. When he entered his new home in Santa Fe, he sauntered into every room, rubbed his cheek against a wall, then settled on my bed and slept, snoring loudly. Funi and I were home. Nancy King's book Morning Light deals with some of the issues that arise when dealing with a catastrophic illness. You can read the first pages of her novels: A Woman Walking, Morning Light, and The Stones Speak. on her website: www.nancykingstories.com. Her books can be purchased from her website, The Trip Shop, on Amazon.com or ordered by local bookstores.